Quand le sol aura été interrogé, il répondra. When the soil has been questioned, it will answer. From La Seine-Inférieure Historique et Archéologique: Époques Gauloise, Romaine et Franque (1866), 388. Used as epigraph in Mortimer Wheeler, Archaeology from the Earth (1954), xii. English by Webmaster using Google translate. 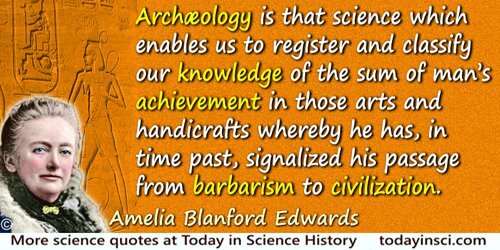 Archaeology is the science that proves you can't keep a good man down. 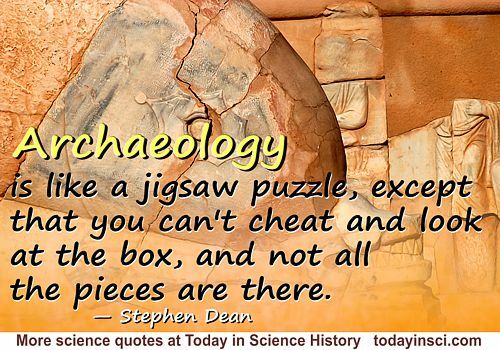 Archaeology is the science that proves you can’t keep a good man down. In Bob Phillips, Phillips' Book of Great Thoughts & Funny Sayings (1993), 24. LORD CARNARVON: Can you see anything? HOWARD CARTER: Yes, wonderful things. Howard Carter’s reply to Lord Carnarvon (George Herbert, 5th Earl of Carnarvon, 1866-1923) upon Carter's first entry to the tomb of Tutankhamen. Show me an archaeologist, and I'll show you a man who practices skull drugery. 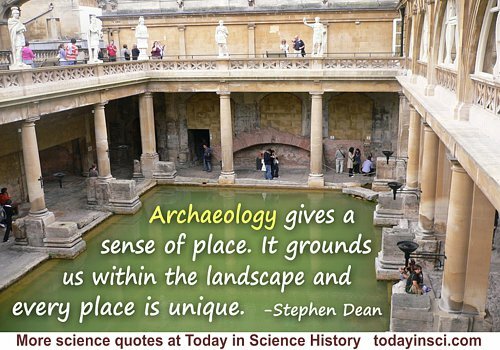 The human mind has a natural tendency to explore what has passed in distant ages in scenes with which it is familiar: hence the taste for National and Local Antiquities. Geology gratifies a larger taste of this kind; it inquires into what may appropriately be termed the Antiquities of the Globe itself, and collects and deciphers what may be considered as the monuments and medals of its remoter eras. To find old sites, you must look in old dirt. Epigraph, without citation, in David Hurst Thomas, Archaeology (1998), 205. Ye are like unto whited sepulchres, which indeed appear beautiful outward, but are within full of dead men’s bones, and of all uncleanness.